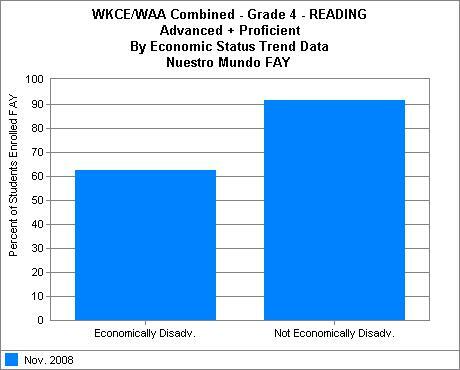 Some good news on the most recent WKCE scores from Nuestro Mundo, as covered in a 17 paragraph Capitol Times story. Good news, which like much achievement data is of limited use. 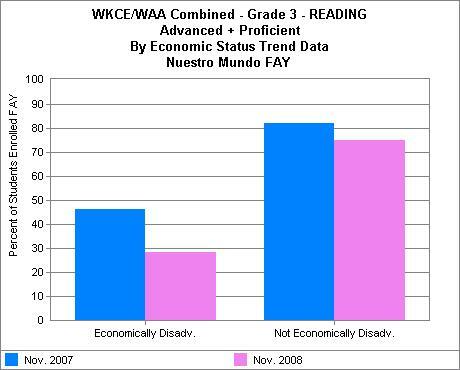 The headline trumpets “Promising” gains and the big news is that the cohort now in 4th grade went from 70% advanced/proficient in reading when they were 3d gaders to 81% as 4th graders. The story also notes that math scores remain dismal and that the current 3d grade cohort’s advanced proficient number is only 51%. One thing not noted is that this gain of 11% represents exactly 4 more students scoring advanced/proficient (from 29 to 33, because of mobility issues cohorts change and students who were not at the school a full year are not reported — of the current 4th grade at Nuestro Mundo, 3 students are not reported because of this). More good news is that low income advanced/proficient raw numbers went from 6 to 10 for the cohort (the cohort went from 12 to 16 in total low income, so it is impossible to say if any individual moved up) , limited English from 5 to 6 (cohort was constant) and Hispanic from 6 to 7 (also a constant cohort number). All good, but really too little change or information to justify any action or inaction. Data should inform actions, but not drive them. Do we really want a system where decisions are made based on how 1 or 2 or 3 kids test on a given day? So congrats for the gains to the Nuestro Mundo staff, students and families and a plea for all — especially policy makers — to keep the good and bad standardized test scores in perspective. All figures calculated from DPI/WINSS.